Event registration solutions from A to Z. Forms, event websites, event applications, onsite check-in and registration services. Need more, just ask. Please enter e-mail address associated with your profile. We will send password recovery information. Smooth communication with handy e-mail settings. Personalised and individual e-mail messages. Quick and simple access to all e-mail messages anytime. User friendly drag & drop builder. Content sharing between forms and events. Create forms in any language you need. Autosave. Get back exactly where you left off. Participant information sharing between forms and events. Custom data export and import. Notifications about registration and changes. Event application with information about event. User submitted data in confirmation e-mail. Digital name badges and handouts. Call for papers. Speaker theme and abstract submission. Attendance check with online lists or scanner application. 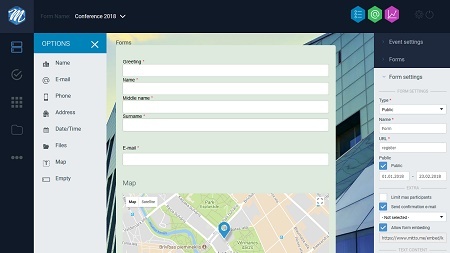 Participant registration and survey forms created with mitto.me are simple and easy to understand for both organisers who create them and participants who fill them in. Mitto.me functions are useful not only for seminars, conferences and congresses, but also for the registration of participants for weddings, sports events and birthday parties. Share content between your events and forms. Copy forms, form content, participant data to manage recurring events. The submitted data is available online on any device, and it is easy to review, manage and export. Ask your participants to upload files, images and videos directly to form. All the data sent from the participant’s device (computer, tablet, smartphone or even Smart TV) are encrypted on our servers by using SSL certificate encryption. Use all features to run paperless events. Inform your participants about event with application and invitation e-mails. Send updates, digital name badges and even handouts directly to event application. Ask your speakers to submit themes and abstracts using registration form and share them directly to event website. Mitto.me team can create fully customized and tested form for you. We’ve built many different forms and we can build a fully customized and tested form for you. The price is based on the complexity of your form. Contact us to discuss your requirements and we will give you an exact price. Lost in rows and sheets? We can help with data validation and import. When it comes to bigger events, all those Excel sheets can be a real nightmare. We have experience in how to deal with different participant languages, categories, etc. Just trust your Excel sheets to our team and we will take care of everything else, including data validation and e-mail management (invitation and reminder sending). PSD, EPS, HTML do not know where to start? Start from teeling us your needs. If you have a logo or just the name of the event but want your invitations, reminders and confirmations to look great, send us your ideas. We will create and setup professional looking e-mail with event branding and logos. All e-mails will be ready to send. We can take care of questions from HOW to WHERE 24/7. All events are different. So are participant questions. We can set up event support phone line and event support e-mail and provide you with professional personnel for questions regarding registration process. Give your attendies new experience with mitto.me participant application. Event application is great to have if your event lasts more than one day or has more than one speaker. 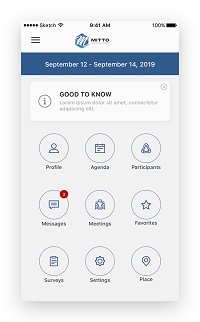 Agenda, participant and speaker list, participant logistics information, pushup notifications and many more functions can be in your next event application. Contact us to discuss your requirements and we will give you an exact price. From classic "one-pager" to complex event communication system. There are no limits for us. Event website now is a must. For simple event info page You can use mitto.me built-in event info page builder. If you need more complex solution with participant list synchronization from registration, agenda with parallel sessions, participant profile, etc., contact us to discuss your requirements and we will give you an exact price. Because your event is unique, tell us more about it. We will get in touch with you as soon as possible. Event size (participants) * Under 100 partic.101 - 500 partic.501 - 1500 partic.More than 1500+ partic. Can I create registration form in two different languages? In mitoo.me you create events. In each event you can build unlimited number of forms and the data, which participants will fill in, will be linked to this event. Just create one form per language or participant category. You can copy or make different content and settings for each form if necessary. Can participants have access to view and edit submitted data? You need to set up a confirmation e-mail. E-mail will contain a secure link (password protected) to participant profile. They will be able to view and/or edit submitted data. How do I add form to my website? You can add form as a link in your website or you can copy embed code to embed form directly into your website. How can I accept payments with mitto.me? Payment processing is possible upon request only. You need to have account in PayPal, Stripe or WorldLine e-payment services (also known as Payeezy). We will then synchronize your account with mitto.me forms. Mitto.me does not collect payments and payment data. How can I manage participant attendance check? Mitto.me has built-in QR-code generator and participant badge creator. QR-codes can be sent in confirmation e-mails or printed out on name badges. Onsite attendance check can be managed with mitto.me application to scan QR-codes on name badges or on participant personal mobile devices. Can I receive notifications about submissions during registration? Yes, you can set up notification frequency and type. Notification e-mail can contain information about new entries, cahnges, tickes sold, etc. Does mitto.me forms have Save & Resume option for forms? Yes, this feature allows participants to save form before submitting it. What browsers are supported for form building and for public forms? For both building and public forms, mitto.me supports Firefox, Chrome, Safari, Microsoft Edge and Internet Explorer 8-11. What fields can I add to forms? Mitto.me have all most common fields - text, single choice, multiple choice, dropdowns, checkboxes, e-mail, table, rating, attachments and social media links. For more info feel free to contact us at mitto@mitto.me. How many users can work simultaneously on one event? Number of system users per company are unlimited, like number of users working at the same time with the same event or form. But please be aware that data saved by one user will be visible to others after browser data refresh. Can I upload files to my forms? 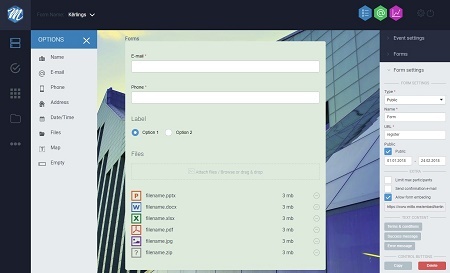 Yes, you can upload files to your forms or ask participants to upload files to forms as well. What happens to all participant data after it gets submitted? All submited data (except payment data) can be accessible in statistics section. You can sort through and filter down entries to view data you require. Actions such as view, edit, create, delete, export and import can be performed for single entry or as bulk actions for selected entries. What other related services mitto.me can provide? 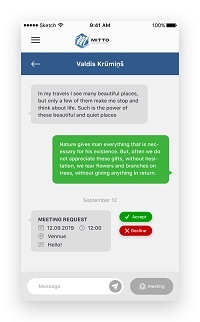 Mitto.me is a platform, based on which we can create an event management tool with all the necessary functions (registration, communication, payments, reports, name cards, application, event webpage). Our team can develop such tool in short terms by providing event organizer with all necessary functions starting from registration and ending with complex event communication system.For more info feel free to contact us at mitto@mitto.me. Have a question about mitto.me? Fill in contact form and we will get in touch with you.